Uppsala you beauty, I will miss you so much! Thank you for all the fantastic memories you gave me, introducing me to some crazy wonderful people, and reminding me again of how brilliant it is to live in Sweden. Uppsala if you haven't heard of it already, is a tiny little city near Stockholm where I spent last year doing my masters. It's technically a city but really is a small university town with a big heart, its atmosphere dominated by a visible youthful exuberance. For me, places are extremely important. Everywhere I have ever lived is profoundly imprinted in my mind with a deep sentimental significance, whether I like it or not. The saying 'the people make the place' is often true, but the place itself will always have a unique atmosphere that is hard to replicate elsewhere. Uppsala possesses one that I will always treasure. I was briefly there to hand in my thesis last week and now I'm back in London, unsure of the next time i'll be back to visit. This is actually the very first September I will not be returning to education and it's certainly a bittersweet feeling. I found myself surrounded by initiation ceremonies, study-groups, new students excitedly chatting about their first weeks. It's a wonderful time of year and I was definitely sad not to be part of it this time round. I'll miss the coffeehouses, the tiny streets, the swedish berries, the long, deep winter and the short, but exciting spring. I'll miss the dinner parties with mismatched plates and looking out at the snow falling, but most of all, i'll miss my dear friends who are still amidst the magic of it all. 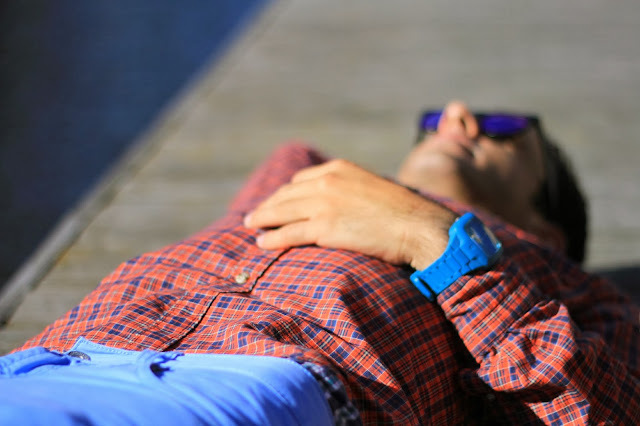 Below are some autumnal moments from my stay..
Dimi rests by the river, stylish as ever in his trademark checkered shirt. An evening walk on my favourite bridge, looking at recent love locks.. I happened upon a trail of painted tin flower-pots that led down the street. As I headed out for a late afternoon walk, I spotted a romantic scene, a couple gazing into eachothers eyes, rowing down the river. Laura giggling during the aftermath of one of our dinner parties, a classic rough and tumble with the gang. Gorgeous afternoon light illuminating the plants in the botanical gardens. It's the weekend! It's bit grey and lackluster in London today however, so I'm not overly enthused about going outside even though I probably should. Instead I'm reminiscing back to last weekend's fun in the Stockholm sunshine when I ate cherry ice cream, wandered around aimlessly with my friends and people-watched to my heart's content. Here is a selection of a few little moments I captured during those final summer days. A trio of friends sit atop the hedges, enjoying a saturday lunch in the park. Over the hedges I spotted a little girl holding a purple balloon that almost looked like it wanted to bring her somewhere. A peek down a small side street show visitors to the local comic-book store. As I walked past stureplan on my way home, this woman was the star of the street. It's funny how much impact a color can make. Weekenders chilled on the steps, enjoying the sunlight on their skin. Both solitary figures exuded an effortless cool. This fellow plays all around Stockholm. He plays sweet, latin notes and at this moment, on this bridge, with the afternoon light and the beautiful atmosphere that surrounded us, all eyes were on him. Two patient seagulls sit atop a rusty skip, gazing out over the harbour. Laura doing what she does best, capturing the beauty around us. As we cut across Stockholm's small streets, Nui looked effortlessly beautiful and mysterious. A musical duo with enchanting choral voices serenaded a relaxed crowd on sunday afternoon. I love ships! If I had the choice I would spend my life at sea, eating biscuits, catching fish, wearing stripes (the entire cliché would be brilliant). I blame this fascination on my parents, who continue to enthusiastically decorate our house with a nautical theme. There must be something so exciting and free about having a boat, being able to set off into the horizon anytime you feel like it, having complete agency over one's own travel. The geographical possibilities are endless, as is the supply of fresh seafood.. it must be fabulous! It's fun to hang out by the sea in Skeppsholm in Stockholm and watch the proud owners of ships moor their boats in the sunshine, wondering where they have been and where they are headed next. The boats themselves are stunning creations, a harmony of wooden planks, steel poles and tightened ropes, they evoke the inevitable drama of the sea. I imagine the lines being pulled to adjust the wind pressure, the sails being rigged to change directions in a storm, the lifeboats prepared for the worst. There is no adventure without risk, as they say, and what could be more risky or adventurous than living life at sea! One can dream..
As I made my way across Stockholms Skeppsholms bridge, I couldn't help but check out this stylish couple. I love the splashed lines of color on her oversized jeans and how it compliments her knotted vest. He is all about a loose fit and muted colors, but his cherry-red hat ties it all together. They make a great pair. The bridge itself is stunning, full of crisscrossed lines and smooth wooden planks, flanked by a gilded crown.